The Serial Posts plugin for WordPress allows you to assign Posts or Pages to a Serial, using custom fields, and then displays a list of all Posts and Pages assigned to the same Serial. Requires WordPress 3.3 or greater. Download the current version of Serial Posts (v1.3.2). Downloaded 6,106 times. The Serial Posts plugin allows you to assign a Serial name to your Posts and Pages, using custom fields, and then displays in the single post/page view a list of all Posts and Pages assigned to the same Serial. Designed for authors who wish to group Posts and Pages into series - independently of the usual Wordpress Category and Tag structure - its usage does not have to be limited to this. You can create as many different Serials as you wish, and assign these to any Posts and Pages that you wish to group together, to create a wide variety of "related post" or other Post/Page groupings. 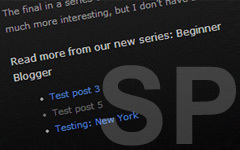 The Serial Posts list is displayed with the [serialposts] shortcode in the Post/Page Editor. The position of the Serial Posts list on your page is determined by where you insert the shortcode in your post. You can create as many different Serials as you wish. Limitation: Currently it is not possible to assign more than one Serial name to any one Post or Page. User options for including the currently viewed post in the list, with or without a link. Configurable Heading for the Serial Posts list. Highly customisable CSS styling of the Heading and Serial Posts list. A Serial Posts template tag is also available for advanced users. Extract and upload the folder serial-posts and its contents to your /wp-content/plugins/ directory. Please ensure that you do not rename any folder or filenames in the process. Activate the plugin in your Dashboard via the Plugins menu. Configure the plugin's Settings page in Dashboard Settings.